PEACEHAVEN take on Sussex County League champions Whitehawk in Sussex's equivalent of the Community Shield, the Norman Wingate Trophy at home on Tuesday, July 27, kick-off 7.45pm, writes Graham Carter. Big-spending Whitehawk are making their debut in the Ryman League this season and have signed former Brighton & Hove Albion midfielder Paul Armstrong, who has more recently played for Eastbourne Borough and Jamie Brotherton from Worthing. Peacehaven, who are yet to make any new signings themselves, will be hosting another Ryman League club, Burgess Hill Town on Saturday, July 31, kick-off 3pm. To complete their mouthwatering list of bigger games, they also face a Lewes XI from the Conference South club on Tuesday, August 3, kick-off 7.45pm. Crowborough Athletic will host Ryman League club Horsham YMCA for their final pre-season friendly on July 31, kick-off 3pm. They will also take part in the John McWhirter Cup for the two firemen who died in the Lewes fireworks factory fire, taking place at Ringmer on July 27, kick-off 7.30pm. Pre-season fixtures: Saturday, July 17: Mile Oak (h) 1st team: 2pm Res: 4pm, Saturday, July 24: Courier Cup at Tunbridge Wells v Tunbridge Wells, Tonbridge Angels and Rusthall 12noon and 3pm, Tuesday, July 24 John McWhirter Cup - Ringmer (a) 7.30pm, Saturday, July 31: Horsham YMCA (h) 3pm. Already played: Saturday, July 10 lost to Little Common 2-0 and 4-1, Tuesday July 13 drew with Sidley Utd 1-1. In division two, Seaford Town have arranged an exciting game away to Division 1 side Crawley Down on Tuesday, July 20, kick-off 7.30pm. They follow this up with a home game against Newhaven on Saturday, July 24 to be played at Downs Leisure Centre, kick-off 3pm. 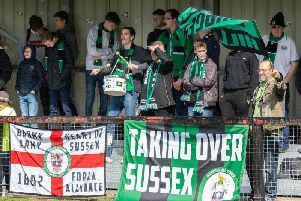 However they urgently seek opponents for Saturday, July 21 at their ground, following the pulling out by Clymping due to a repeat fixture coming up between the two sides in the Sussex County League on August 14. Any team interested in a game on that date should contact Seaford chairman Mick Webster on 01323 899218. In division three, Uckfield Town have a tough test when they travel to Blue Square Premier Bet club Eastbourne Borough to play their reserves on Saturday, August 7. Pre-season fixtures: Saturday, July 17: Westfield (a) 1st team - 2pm Res 4pm, Saturday, July 24: Clymping (h) 1st team - 2pm, Res - 4pm, Tuesday, July 27: Sidley Utd (h) 7pm, Saturday, July 31: Tackleway (h) 3pm, Saturday, August 7: Eastbourne Borough Res (a). Results: Saturday, July 10 drew with Punnetts Town 1-1 (a). Saltdean United will be entertaining a trio of Division 2 sides, AFC Uckfield (formerly called Wealden) this Saturday, July 17, kick-off 1pm, Lancing on Saturday, July 24, kick-off 1.30pm and Sidley Utd on Saturday, July 31, kick-off 1.30pm. Pre-season fixtures: Saturday, July 17: AFC Uckfield (h) 1pm, Saturday, July 24: Lancing (h) 1st team - 1.30pm, Res - 4pm, Saturday, July 31: Sidley Utd (h) 1st - 1.30pm, Res - 4pm, Wednesday, August 4: Seaford Town (h) 7.30pm.